Good science is at the heart of West System epoxy. Comprehensive testing is the basis of that science and is essential for the development of improved epoxy formulations and better construction and repair methods. A large portion of West's testing resources are devoted to continuous product development and improvement. New resin and hardener formulas, ingredients and combinations undergo a wide range of tests to compare fatigue strength, compression strength, glass transition temperature and peak exotherm. Additionally, qualified samples are tested for hardness, tensile strength, tensile elongation, tensile modulus, flexural strength, flexural modulus, heat deflection temperature, impact resistance and moisture exclusion effectiveness. 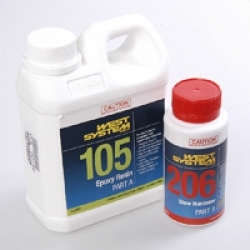 West System epoxies are set using a 5:1 resin / hardener ratio. Refer to the paired resin & hardener sizes listed in the table below. Epoxies are safe when handled properly. To use West System epoxies safely, you must understand their hazards and take precautions to avoid them. The primary hazard associated with epoxy involves skin contact. West System resins may cause moderate skin irritation. West System hardeners are corrosive and may cause severe skin irritation. Resins and hardeners are also sensitisers and may cause an allergic reaction similar to poison ivy. Susceptibility and the severity of a reaction varies with the individual. Although most people are not sensitive to West System resins and hardeners, the risk of becoming sensitised increases with repeated contact. These hazards also apply to the sanding dust from epoxy that has not fully cured. These hazards decrease as resin/hardener mixtures reach full cure. Refer to product labels or Material Safety Data Sheets (MSDS) for specific product warnings and safety information. West System is considered to be the industry standard epoxy for high strength waterproof adhesives. The 5:1 ratio epoxy makes it easy to dispense and use.